Successful auction of 3G and 4G spectrum licences has opened up new world of fast internet browsing and exploring other hidden aspects and advantages of information technology. Zong, Ufone, Mobilink and Telenor got licences to provide 3G services in Pakistan while Warid didn't participate in the auction. Zong also got one of two licences available for 4G services, the second licence will be auctioned later on. 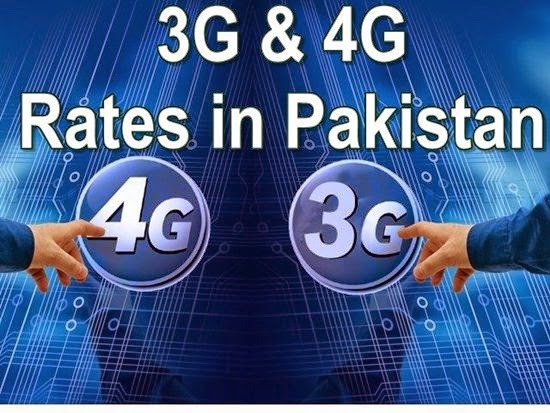 3G data services will be available to all prepaid and postpaid customers of Zong, Ufone, Telenor and Mobilink in coming few weeks as all the infrastructure has already been setup and systems are also capable to handle 3G and 4G. Initially 4G services will only be offered to postpaid customers of Zong, however 4G may be offered to Zong prepaid customers after sometime. 3G and 4G technologies are not expected to be cheaper in Pakistan. According to media sources, per megabyte rates/ tariff of 3G and 4G internet will be higher than existing GPRS and EDGE internet services. Telecom companies have invested large amounts to get licences and they will recover it from customers' pockets. But it is hoped that with the passage of time, rates of this new technology will be lowered. 3G or 4G will be practically of no use for majority of people in Pakistan as only latest smartphones supported this technology. As soon as we get any information, we will update here about 3G and 4G rates but it can be imagined much expensive than GPRS. 3G is also expensive in neighbor countries e.g. UAE, India etc. I enjoyed 7.5 Mbps speed on MTN (Middle East Telecomm Network) 3G in Sudan back in year 2011. The package was 30 SDG (approx Rs 1000) per month with unlimited bandwidth. and 7.5 Mbps means exact 7.5 Mbps. But here in this country which is although much much better than Sudan yet unfortunately we cannot get 7.5 Mbps coz it had been the worst experience by the users and bluffing attitude by the telcomm companies that they never provide the desired speed. It would be a wastage of money buying a 3G or 4G package here in this country where 99% nation comprises Munafiqeen. To Janab ap hi Sambhal lo na phir pakistan ko hamain kiu suna rahey ho k kiya acha hey kia Bura. Realistic Bano or haqiqat to qabool karo. Haqiqat ko qabool krna aur baat hai. Aur usko thek krna aur baat hai. Tum jesy logo ki waja se is mulk me theek se tarakki nahi ho rhi. If u can't make it better than don't make it worse.isky baray me kuch acha nahi soch sakty to isko bura bhi mat kaho. Khud to kuch krna nahi hota tum jese logo ne bs bssten krni ati hai. Kya keh rhy thy? Tum hi sanbhal lo? Ok hum sanbhal len gy apny mulk ko. Tum niklo phir yahan se. Jiska khatay ho usko hi bura kehty ho. Aise logo ko namak-haram kehty hain. Goroon ki ulado un k ghod main hi ja kar baitho. Pakistan na aaya karo. Yeh mulk tumare jaise logon k liye nahi. abay bharwo 3G network k baray main baat ho rahe hai pakistan ki kuss main kyun wari ja rahay ho? oOOOO L PAKISTANIO PAKISTAN MN BHI SASTA HAI 3G PTCL WINGLE LAY LU NA 3G 750PM WITH 30GB BANDWIDTH OR IS SAY SASTA KIA LU GAY AND 90% COVERAGE area WITH WIFI HOTSPOT RECHARGABLE USB YOU CAN CONNECT MOBILE WITH IT ANYWHERE SO LOVE PAKISTAN PAKISTAN IS NOT BAD THE PEOPLES ARE BAD VERY BAD IN FACT. Pakistan ka matlub pata hai la ilaha illallah. Hum say pocho jo kafiro may rahtay hai magar Pakistan ko anay ko tarsatay hai jasa hai phir be humara watan hai .